Convert 35mm film Slides and Negatives into 22 MegaPixel JPEG images with a push of a button! 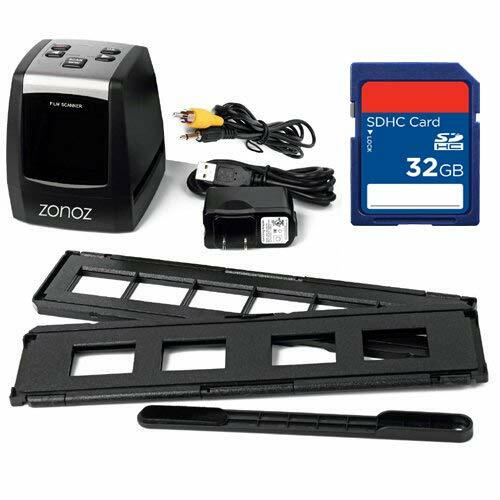 - With the zonoz FS-ONE film scanner, you can easily convert all your 35mm film into digital images. With simple and intuitive controls, you can now preserve your treasured memories. All you need is to plug your FS-ONE into an AC outlet or USB port and scan your 35mm film negatives or slides. 35mm Negative Film and Slide Converter Scanner with High Resultion 22MP Image Output - Fast Conversion, only takes seconds to scan an image. View More In Printers & Scanners. If you have any questions about this product by zonoz, contact us by completing and submitting the form below. If you are looking for a specif part number, please include it with your message. Epson Perfection V800 - Bundle - 2 Slide Holders Or Film Guides 2 Units!! !